From the very beginning, this segment took a negative tone against the President and his administration, and like many interviews and stories, was completely one sided. Mitchell framed the story, as many media outlets do, in a way to give the impression that the government is spying on everyone at all times, "As we said, Capitol Hill is buzzing about the President's admission to spying on Americans without obtaining warrants," but he ignored the limited nature of the program in that it was limited to international communications and one of the parties must have known ties to terror. After introducing Jonathan Turley, Mitchell asked him a question designed to defend the critics of the administration and their arguments on the law, "Let me ask you something, those opposed to the President, do they have any legal ground to stand on at this point?" 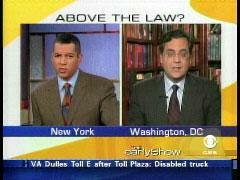 Turley took advantage of this opportunity to accuse the administration of committing a crime, "This operation was based on a federal crime, it is a crime to engage in surveillance, to order such surveillance without having a court order from a judge..." The question and answer again provide an impression that the "domestic spying" is widespread, rather than in specific and limited circumstances. Turley downplays the legal position of the administration, saying "For those who are supporting the President, they are really going back to a familiar theme with this administration, they are arguing that the President has the inherent authority to effectively circumvent the federal law." Instead of following up with a question about what the administration is arguing legally, Mitchell asked a question about the Foreign Intelligence and Surveillance Act (FISA) and ended his interview talking about impeachment. In his last question, Mitchell inquired, "Jonathan, very quickly, down the road do you see this leading to impeachment proceedings against the President?" Turley, responded in a way that left little doubt that he believed the President ought to be impeached, "Well Russ, what I can tell you is that I do believe this is a federal crime and it would constitute an impeachable offense, the remaining question is whether that crime was committed and whether there is a political will to actually look into whether this is a high crime and misdemeanor." Russ Mitchell: "As we said, Capitol Hill is buzzing about the President's admission to spying on Americans without obtaining warrants. The administration says the President is within his legal right as Commander in Chief. But, Republican and Democratic Senators are calling for hearings saying they believe the President has violated the law. Jonathan Turley is a Constitutional Attorney, Jonathan good morning to you. Let me ask you something, those opposed to the President, do they have any legal ground to stand on at this point?" Jonathan Turley: "Well for those who are opposing the President, this seems a very clear question. I mean in my view quite frankly, the federal law is quite clear. This operation was based on a federal crime, it is a crime to engage in surveillance, to order such surveillance without having a court order from a judge, either under the traditional process of Title 3 or the so called "secret court." So on its face, the federal law seems quite clear. For those who are supporting the President, they are really going back to a familiar theme with this administration, they are arguing that the President has the inherent authority to effectively circumvent the federal law." Russ Mitchell: "Let me ask you something, we've heard about a lot of acts and laws in the last few days. The Foreign Intelligence and Surveillance Act, what is it and are Americans affected by it?" Jonathan Turley: "Well that's right. The FISA law is indeed the secret court, and calling it a court sort of dresses is it up a bit. I went into this court as a lowly intern during the Reagan administration with the NSA, and it makes a traffic court look grand in comparison. It's basically a judge sitting in a special room that can't be penetrated by enemy surveillance and he or she signs these secret applications. Now the law, the FISA law, gives that judge virtually no ability to turn down an application, that's why there's been 19,000 or so applications, only 4 have ever been denied." Russ Mitchell: "Jonathan, very quickly, down the road do you see this leading to impeachment proceedings against the President?" Jonathan Turley: "Well Russ, what I can tell you is that I do believe this is a federal crime and it would constitute an impeachable offense, the remaining question is whether that crime was committed and whether there is a political will to actually look into whether this is a high crime and misdemeanor."